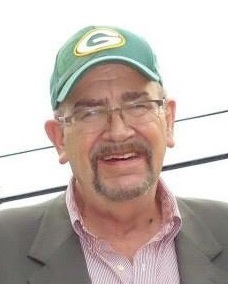 David W. Moeller, age 66, passed away Friday, October 19, 2018 at ThedaCare Regional Medical Center – Appleton. He was born in Waupaca on September 8, 1952, a son to Elmer and Agnes (Carlberg) Moeller. He worked for several years at the Waupaca Foundry where he was affectionately referred to as “Painter Dave”. His hobbies included painting marvelous works of art, fishing, entertaining people as Frankenstein in Chicago, and watching the Packers. He loved to talk and tell stories and enjoyed long conversations on the phone with family and friends. His daughters were the highlight of his life. He will be dearly missed by his two daughters, Jackie (Jeremiah) Anderson of MN and Liz Moeller of Waupaca; a brother, Ray (Donna) Moeller of Eau Claire as well as many nieces, nephews, cousins, other relatives and friends. Preceding him in death include his parents, and two sisters, Marilyn Marquard and Linda Skenderi. A memorial service will be held at 5 p.m. Wednesday, October 24, 2018 at the Maple Crest Funeral Home. Visitation will be held from 2 p.m. until the time of the service.